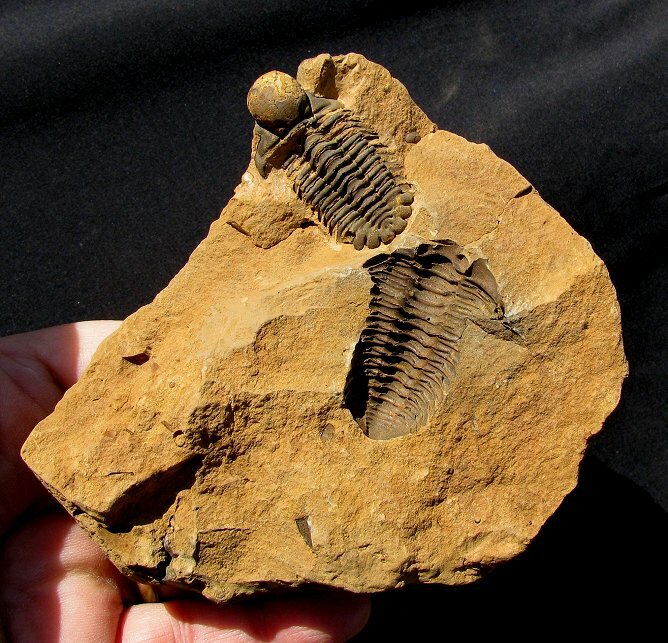 This rock contains one of the most sought-after trilobites in the world. This is an excellent Actinopeltis sp. from the Ordovician of Morocco. This amazing specimen is from the Diacalymene concretion layers, not the more common Ktaoua Sandstone Formation. The Actinopeltis trilobite is prone and well preserved. The bug displays excellent detail - the HUGE bulbous glabella is fully intact and very easily seen, and the rounded tail lappets are also beautifully preserved. But it gets even better - there is a perfect Diacalymene preserved smack dab right in the middle of the same concretion!! This is probably the best quality Diacalymene we have ever seen in a concretion, and it just happens to be sitting next to an Actinopeltis! The natural, dark brown trilobites contrast wonderfully with the lighter-colored concretionary matrix. And, remember, this is a split pair concretion - both halves of the concretion are present and offered together - two fossils in one! This is a screamin' rare, one-of-a-kind association piece featuring one of the most sought-after trilobites found in Morocco.